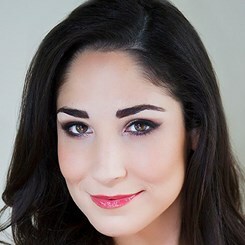 Admired by The Wall Street Journal as an “impassioned, and impressive” talent on the rise, soprano Christina Boosahda has been featured in a variety of roles including Donna Elvira (Don Giovanni), Fiordiligi (Cosi fan tutte), Lady Billows (cover, Albert Herring), Mrs. Anderseen (A Little Night Music), Antonia (The Tales of Hoffmann), First Lady (The Magic Flute), Miss Silverpeal (Impresario), The Rooster (The Cunning Little Vixen), Gabrielle (La vie parisienne) as well as Woglinde, Gerhilde, and the Dritte Norn, in an adaptation of Richard Wagner’s Der Ring des Nibelungen. Ardent about contemporary opera Ms. Boosahda had the privilege of premiering the role of Bita Parvin in Houston Grand Opera’s production of Gregory Spears’ The Bricklayer. She later returned to the Houston Grand Opera stage in the Loretta/Mama in the world premiere of David Hanlon’s Past the Checkpoints, and as Amanda/Ameliora in Sterling Tinsley’s Daniel and the Dreamcatcher. Other notable premiere performances include; Lulu Baines in Robert Aldridge’s American opera Elmer Gantry, Mrs. Hurstwood in Robert Aldridge’s Sister Carrie, Step-Sister One in Kurt Erickson’s What Your Parent’s Don’t Want You to Know, Mrs. Kimball in Jeremy Beck’s Review!, and Marketer One in Paul Salerni’s Tony Caruso’s Final Broadcast. Upcoming engagements include the role of Beauty 2 in Frank Proto’s Shadowboxer, and the Southern California premiere of the title role of Anya, in Adam Gorb’s critically acclaimed, Anya17. Ms. Boosahda earned her bachelor’s degree in vocal performance from the Ithaca College School of Music. She obtained her Master of Music degree with a concentration in vocal performance at the University of Houston’s Moores School of Music, where she studied under the tutelage of Cynthia Clayton. Request Lessons with Christina Boosahda today!